As promised, I will take one last look at Poitiers. I have gathered up some previously unblogged photos that are somehow important and representative of my time abroad. The city’s largest and most beautiful park was pretty much across the street from where I lived. I could easily just drop what I’m doing and leave any hour of the day to go relax in the park. 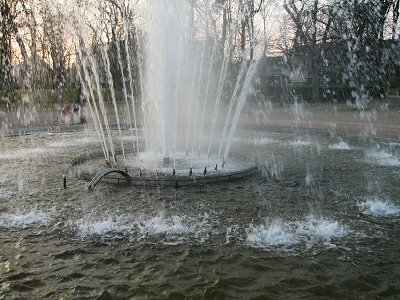 A large fountain adds energy to the city’s main park, although this fountain was broken for part of the time. It was working near the end again when the park was well in season. Narrow streets and crowded sidewalks are common. It’s also not unusual to have a street where pedestrians and cars share the same area, requiring that you are careful when a car is coming. 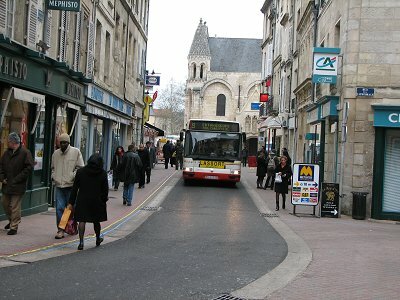 In this photo, you see a large city bus coming through just below the Notre-Dame church, which is one of Poitier’s most recognizable and promoted buildings. Although this looks like the remains of some really fancy castle, I think it’s perhaps just a fancy wall created for the park above. I’m sure this shot would look very much the same in 100 years as it did 100 years ago. Much of Poitiers has this timeless appearance. 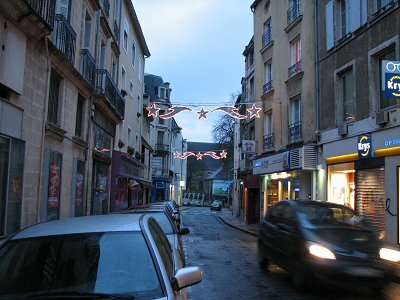 This photo brings me back the most vivid memories of my first impression of Poitiers. The weather wasn’t too good yet, and the Christmas decorations were still up everywhere. All of central Poitiers pretty much looks like this, and it seemed so different and hard to navigate at first. This was also the time when the whole 5 months was still ahead of me, yet to come, and everything new to experience. I have enjoyed keeping you informed and sharing my favourite images. I will likely keep blogging about everything how it is back in North America. That’s all for Europe, 2007. Great blog… going to miss hearing the latest from Europe. Glad you’re home again safely.